many dimensions, people with a conscience, with a depth ..."
" ...take those ideals, to process them, put them into stories." 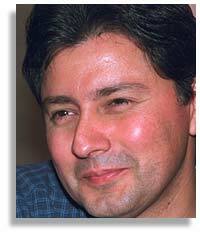 This interview of Carlos Avila was conducted for In Motion Magazine by Fred Salas in Los Angeles, December 23, 1999 at the conclusion of the production process of Carlos Avila's first feature-length film Price of Glory. Fred Salas: Los Angeles is your home? Fred Salas: How long have you been in L.A.? Carlos Avila: I moved here when I was two years old. I was born in Lima, Peru. My parents split up when I was two and my mom whos Mexican brought me and my brothers and sisters back to live in Los Angeles. I've lived here since that time. I toyed with the idea of going to college or graduate school elsewhere but always gravitated back to Los Angeles. I grew up in the Echo Park area. Lived there till I was nineteen and then moved out to go to school in another part of Los Angeles. I've pretty much stayed in the area that I went to school in. Fred Salas: Where did you go to school? Carlos Avila: For my undergraduate work I went to Loyola Marymount. They had a general media curriculum there. I made some short films, and was encouraged by some of my professors to continue studying film. It never occurred to me to go to graduate school, but they all seemed to think it was a smart thing to do. So I went, checked it out. I took a couple of years off and worked doing production assistant jobs. I met some good people along the way, and ultimately started going to graduate school at UCLA. I was probably there for longer than I should have been. I went to school with Alexander Payne who did Election. Rupert Wainwright who did Stigmata. Kayo Hatta who did Picture Bride. I received a lot of inspiration from the people I went to school with. Fred Salas: You said your professors encouraged you. Did they tell you what they saw? Did they say you are doing this better than we've seen other people doing it? We think you might be able to hone this into strong work? Carlos Avila: The short films were very, very, short, three minute films. But they seemed to see some promise and they encouraged me. I wasn't doing anything ground-breaking, but the fact that I was able to put images together and tell a story in a very economical way was something that I think they responded to and wanted me to pursue. I appreciated the encouragement. Fred Salas: Lately I've read a couple of interviews with directors who have really big films coming out who are saying things like "film school is a waste, don't go to film school". There's a movement of young filmmakers coming from commercials, video, and television who are saying that. What do you feel about that? Carlos Avila: It's hard to say what works for another person. It seemed to be a way to go for me. My family had no connection with the film business at all. A structured environment like school seemed to be a good place for me. I can see a lot of the drawbacks of being in film school. At times problematic situations arise with a structured curricula but I found after a while, particularly in grad school, that after a couple of years it wasn't about the film school that you were in -- it was about the people you were around. The stimulation and excitement about what you were doing, sharing those experiences, exchanging ideas. That was great. There were one or two professors that really inspired me while I was there - and that made it worthwhile. It was being in an environment where the equipment was available and the help was inexpensive and you can take advantage of being a student. That opened doors. Other people found it their way and hopefully I'm finding my way. 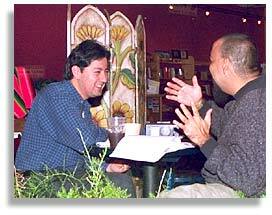 Fred Salas interviewing Carlos Avila in a cafe in Los Angeles. Photo by Nic Paget-Clarke. Fred Salas: Talking about making that leap. You came out of the cold. It wasn't part of your family. There weren't a whole lot of connections. I remember something you told me a long time ago that your grandmother had said about filmmaking "Es un negocio para los ricos" (It's a business for rich people). Carlos Avila: Yes - exactly. Fred Salas: And that stuck with me. First of all it's a great phrase. It says so much about where we come from, and where we are not supposed to go. Fred Salas: You came from there but you went here. You came here. You still did it. What was that extra something? You just wanted to make film? You wanted to make film about your experience, the Chicano - Latino experience? Carlos Avila: After a while it becomes a habit. What are you going to do with your life? You invest so much time into wanting to tell Latino stories. It seems to me you become this believer in a possibility. If you are fortunate like I have been where you do have some of those possibilities turn into realities then that is very encouraging. That keeps the motor running. That says "Okay I did that, now this other thing seems to be available to me. Why not keep pursuing it?" I think part of it is you don't know any better. You see so many people pursuing these goals that it seems that maybe there is that realm of possibility. But back to the film school situation. The fact that people I had gone to school with were having some success put it within the realm of something that was very do-able. We went to film school. The film making process was de-mystified. That was exciting. You say, I can do this. This is something that is tangible, something that is real, something that I can have access to. So I tried to do it. Fred Salas: Has it taken a long time to get from your first shorts to your first feature? Carlos Avila: I wanted it to take that long. I went through a process of making shorter films to learn some skills. Then I made my thesis film at UCLA, and it did very well for me. Carlos Avila: Yes. I learned from doing that. Then, fortunately as soon as I got out of graduate school I was able to make another film, La Carpa, a one hour drama which eventually aired on PBS. I learned from that also. Next I directed, wrote and produced, Foto-Novelas, three one-hour episodes, with high production values. It was like a Latino Twilight Zone. Actually there were four total, but I directed three of them. These showed me as a filmmaker who could work in a variety of genres. One of the episodes was a boxing story, as you know, and that showcased me as a director of action sequences. All those stepping stones eventually lead to being here. A lot of people get out of school, make one film, and want to make that jump into feature films. A lot of people make mistakes and spend a lot of time and money doing something theyre not ready to do. Some people are ready. I didnt think I was ready to make the leap. I wanted to do smaller projects that gave me the skills that eventually got me to this place. Fred Salas: I think your women characters are very good, but I think your men characters are incredible. Your male characters are not just macho, there's a real vulnerability there. Do you think about that? Carlos Avila: With all the characters, male or female, trying to find some complexity in them is very important to me. To give them some dimension. Certainly within the realm of stereotypes, which is something we see a lot of, the reason they are stereotypes is they are types, they are cookie-cutter representations of a certain perception. I've always wanted to create characters with many dimensions, people with a conscience, with a depth that might allow an audience to see a different side to Latino characters. That's been a very conscious thing. Even the people who are villains have complexity to them. Fred Salas: Do you think young Latinos today are looking for Latino role models? Carlos Avila: When I was growing up I would watch Lucha Libre (Mexican wrestling) on TV and I wanted so desperately to be Mil Mascaras (a wrestling star), he was this heroic figure that embodied a mythological presence in my world as a child. When he would come to town to wrestle at the Olympic Auditorium my family would pile in the station wagon and go see him. Even though it was only a wrestler, it was someone that electrified my mind as a kid. You know, I get invited to talk occasionally at elementary schools and high schools. Although I have mixed feelings about the whole notion of being someone to look up to, of being a role model, I think it is important for young people to see that the things that they are aspiring to are do-able. If through some conversation with myself, or some conversation with another person, who might have worked to have some opportunities, they can identify with the fact that I'm just some kid from Echo Park who found a way to make a movie or two -- then that's exciting. Ill never be Mil Mascares to those young people but I try to do what I can. There's a lot of responsibility that comes with the role model mentality. I don't think anybody should have that put upon them. But if it's something that the young person can identify with and they can become empowered by that, then I think that is very positive. Fred Salas: I think there isn't a hunger with young people these days to "find themselves culturally. Did that hunger fuel you? Carlos Avila: In a less overt way. I was always surrounded by my culture. It was always a very positive experience. I never was ashamed of it. I was never made to feel that I was less because of whatever heritage I had. Other people get to college and they go through a process of empowering themselves through cultural identity, they have a MEChA type experience. I think that's very good. But I never felt that need to be so consciously active in trying to embrace an identity because it was already a part of me. It was a very intrinsic part of my reality. I welcomed it. Fred Salas: Maybe it's not fair of me to say that about young people. I just haven't heard people say "I want to know more about myself, more about my culture so I'm going to go out and make a film, or find a film to show to people". I used to hear that a lot. I was wondering if you had felt that. Carlos Avila: I fall somewhere in between a couple of generations. Many of the early U.S. Latino filmmakers were very directly a part of the movimiento (the Civil Rights Movement), and the political and cultural ideals that were associated with that. I came just a little bit after that. The process of seeing the films that came out of that era, and being inspired by them, reading and being open to some of those ideas, that was important to me. But those ideals weren't my primary objective in making films. Carlos Avila on Sunset Boulevard in Los Angeles. Photo by Nic Paget-Clarke. My films were formed by those ideas but I also wanted to make dramatic films and to tell stories that I was intrigued by. Now there is another, younger, generation of filmmakers who have a very different sensibility. They are fascinated by a lot of the newer genres and technologies. I feel like I'm straddling somewhere between the two. Fred Salas: At the San Diego Latino Film Festival this year we've received a dozen features by first-time feature directors with high production values from first-time feature directors in addition to the shorts, the university-generated work, the activist pieces. It's very exciting, something is happening here. Do you feel that you are part of this? Carlos Avila: I feel very much a part of it. Certainly all those people are my peers. People who have found a way to get these stories on screen. I've nothing but admiration for those who are getting their hands dirty and trying to find a way to get Latino stories on screen. That's important. You know, there's a lot of important work being done by people in an activist position, boycotting the powers that be to try and get more Latino images on screen. Its important work. However, I also believe that part of that activism should be directed towards supporting some of these filmmakers, getting their images seen, to show that there is an alternative point of view. Some of these filmmakers are taken for granted. They are perceived perhaps as being small potatoes. People always want to see the big time success, that big splashy Hollywood success story, people hitting those home runs. But I'm a firm believer in the notion that from small things big things one day come. We've all started that way. Miguel Arteta with his short film, Lucky Peach, Robert Rodriguez with Bedhead. These are all people who were making short films and eventually acquired enough skills and resources to be able to make something on a different level. It sounds like all these features and short films that are coming out need to be supported and these filmmakers need to have venues and audiences. That's going to create an appetite among our audiences to support the next group of filmmakers when they do their work. Thats why Latino film festivals like the one you put on are so essential. 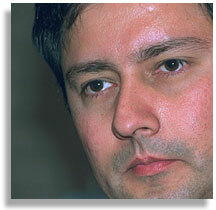 I was very lucky fifteen years ago when I interned for Gregory Nava (Selena, My Family). He took his interns very seriously and one day when we were working for him he invited us to have an Intern Film Festival. We screened all our films for him and it made us feel important. Here was the man who made El Norte and he was looking at my three minute student project. It was great. He was always encouraging. Now fifteen years later, he continues to be a friend and advisor. Thats the kind of affirmation you need to survive. Thats what we need to give up-and-coming directors. I always flash back to The Heat is The Devil, that indie film from New Mexico from a couple of years ago - where did that come from? Where did that go? Here was a couple of guys who had this idea in their head, went out and made a movie for $30,000, and put a very compelling story on screen. That's a film that should have gotten some distribution. That should have found an audience that was interested and hungry for this kind of stuff. It's always amazing that people find a way to get a story told -- but now I think the other part of it is getting the audiences to support it. Fred Salas: What is your favorite Carlos Avila piece? Carlos Avila: I'm very proud of Price of Glory. Up until it I'm most fond of Distant Water, though there's a lot of things I would change if I were to make that film again. I remember sitting one afternoon, I was at UCLA at the time, and just writing it. Writing the storyline in about four or five hours. It seemed to be something that needed to come out. Writing for me has never been that easy for me since. It was a dumb idea for me to go out and make this film as a 1940s period film as a graduate film because the resources and the control I had over the environment, the logistics were very limited. But I went off and did it. I tried a bunch of things. I tried to deal with a social theme, and have a story with a sense of humor. And it worked. Another favorite of mine is In the Mirror, a Foto-Novelas episode. The thing that I responded to there was that it was a very human story that had some cultural issues and gender issues. I tried to tell it in an inventive way, a dark fairy tale sort of a way. I used visual effects, which I had never messed around with before. It was a good feeling to be able to tell a very well-crafted story and effect people emotionally, again with humor. 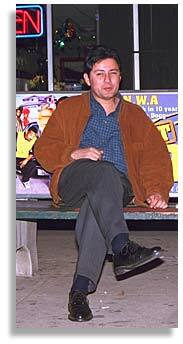 Fred Salas: Have you made any documentaries? Carlos Avila: I've made a couple of short documentaries. One was a commissioned piece for an art gallery at UCLA about Chicano murals. It's very much like a news feature, with some nice transitions, and a visual style to it. The other one was many, many years ago for a shelter for political refugee kids in the Koreatown section of Los Angeles, a profile piece. I met some great people there. Fred Salas: I was looking through some files on the history of the San Diego Latino Film Festival, and I saw you curated a program at UCLA in the early days of Latino film festivals. What would you program now? Carlos Avila: I love John Valadez's documentary Passing It On, that would certainly be on the program. David Rikers film, La Cuidad is a must. Lourdes Portillo's piece The Devil Never Sleeps - it's a great film, fantastic, she's a tremendous filmmaker. Alex Riveras Papa Papa a great piece. Esteban Zul's The Flower Wars. Its a wickedly funny satire - not for those who take their cultural history too seriously. Fred Salas: Sounds like a good program. Carlos Avila: Oh, and Jimmy Mendiola's Pretty Vacant - that must really be on there. I cant wait for Jimmys new film. Fred Salas: And so Price of Glory. It's way ahead - it's an amazing piece. Who wrote it? Carlos Avila: The original stage play was written by Phil Berger, who was the boxing columnist for the New York Times for many years. The stage play was brought to me and Phil and I collaborated on the adaptation of the screen play. He'll get screen credit. We worked very closely on it. Fred Salas:You must be very proud. Carlos Avila: Yes, very proud. Very thankful that after all these years, Phil's original story and our collaboration on the screenplay actually found a way to make it on screen in a way that is very true to the initial intentions of the story. That's very gratifying. Gratifying in the number of Latino characters who have a home on screen. They deserve to be up there. The characters are very complex, multi-dimensional portrayals. Young characters. It's a story about a father and his three kids, the type of story that I love. In this case, three sons are struggling to find a sense of who they are in the face of a father who is very strong and domineering. The process of individuation that each of these kids go through is exciting to watch. Fred Salas: What was the most difficult thing about shooting the film? Carlos Avila: I think adapting to the scale. The biggest thing that I've done before in terms of number of shooting days was eighteen days for La Carpa. So now, to go out and do 40 days in principal photography and two more days in pickups. It was a marathon. You find that you are running a marathon. I think also the scale in terms of production logistics. You walk out and you say, My god, what are all these trucks here for. Did I stumble on to the wrong set? Oh, they are here for my movie. The scale was just amazing. We shot four days at the L.A. Forum with hundreds of extras. I found myself the ring-master in this three ring circus. Once you get your head around all then I think youre ok, but there was a process of coming to terms with the scale we were working on. But, this was a story that I was really in love with and hung in there with Phil Berger for five years to try and get it made. It was a story that we believed in. In terms of a filmmaker taking the next step up it was probably not the smartest move to make because at the end of the day there was eight boxing sequences in it. There was a lot of characters. There was a lot of locations. In that regard, it perhaps is a more complex project than I would have hoped would have been my first feature. But it was this one and I think we did a wonderful job with it. Fred Salas: Were the boxing sequences a whole other film? Carlos Avila: They should have been. It was one of those things that drives you nuts. You know sitting at home watching the DVD of The Boxer, (the Daniel Day-Lewis film) and listening to the directors commentary. That movie has some fantastic boxing sequences in it, but there was one boxing sequence early on in the movie that they shot for seven days, and it wasnt even the climax of the movie. We shot about seven days for all our boxing sequences combined. Our climactic fight was shot in three and a half days. It's a fairly monumental fight between Jon Seda and Louis Mandaylor. The boxing was great because, as I said I had done a short film as part of the Fotonovelas series that was a boxing film and I worked with the same fight choreographer on the new film. We understood each other. We knew each other. His name is Benny The Jet Urquidez - a kick-boxing champion - he's a legend. Right now he's doing the fight choreography for one of the Ali television movies that is in production. Benny was great. We knew what we wanted the fights to feel like, look like, and we were able to achieve that. There was a lot of running around that we did, a lot of run and gun. A lot of trying to capture that visceral reality as quickly and as effectively as we could. Fred Salas: I don't come from a perspective of sports and boxing movies - but you really feel this movie. Yes, visceral is a great word. You are right there. You feel it. Carlos Avila: Wait 'til you see that last fight with the mix, the music, it's huge. Fred Salas: How about the music in this film? Carlos Avila: I'm really proud of two things. The score was written by Joseph Julian Gonzalez, someone who I have worked with on four occasions. He wrote a beautiful score for us that is Latino in spirit but not clichéd, and a wonderful expression of the dramatic themes in the film. We went up to Seattle to the Seattle Symphony orchestra, where a 64-piece orchestra played Joseph's music. The movie has such a big, elegant feeling to it. It's very exciting to have had the support of the studio on that level. They said that this film deserves a big sound to it. I'm very pleased about that. Simultaneously, we also have a strong collection of source music cues that are being written by some terrific bands - rock-en-español and Latino hip-hop bands - that I think just as dramatically as the characterizations show a different take on Latino reality. I think through those source music cues we show that Latino music is exploding, changing, evolving. The genres in which these artists are working are vast and exciting. We try to capture that in the movie. We've got everybody from Aterciopelados to Ozomotli to King Chango to Pastilla and El Gran Silencio. We've got songs from the Texas Tornados and Los Lobos in it. We've got Mano Negra, a French band that was very influential in the rock-en-español movement. It was very important to me to try and create a dramatic vehicle in which we could embody some of this great music. Fred Salas: Is there going to be a soundtrack CD? Carlos Avila: Yes, and hopefully, a couple of singles. Fred Salas: Are you nervous about the film - or excited that it's coming out? Carlos Avila: Excited and nervous. It's a tremendous commitment that the studio, New Line Cinema has made to a Latino film, to get behind it as much as they have. I certainly want them to reap the rewards of that commitment. That's something that I hope actually happens so that they will be encouraged to make more. So that other studios and production companies will have the faith that this type of a story can be told. At the end of the day you don't want your film to be a well-intentioned experiment. You want it to be a film that finds an enthusiastic supportive audience. In particular, you want a Latino audience to find it because you think that they will respond to it - I think that is very, very important. You want them to come out and see themselves on the screen, reflected in a way that is unique and unusual, and that they will take some heart from. Simultaneously, you want to convey a Latino experience to a wider audience. Whatever work you've done to dispel stereotypes or preconceptions, you want to see that actually happen by people embracing these characters and going on this ride with them. Connecting with them emotionally. That's why I do this work. Fred Salas: The film deserves to be successful - and I think it will be. You want people to see the film. It always makes me crazy when a filmmaker says "I don't care if anybody sees my film." Then why is he or she doing it? Carlos Avila: Exactly. I don't have pretensions about this. It's hopefully a film with a lot of heart that is meant to reach a large audience. It has other serious intentions in it, but I want it to reach a lot of people. I want it to have commercial success. I want it to be pivotal and a source of encouragement for those people that can allow a film like this to get made. So many wonderful films that I admire, Latino films, have come and haven't found the audiences that they deserve. I don't want this to be one of those films. I think it's success can only mean good things for many, many people. Fred Salas: You talk about seeing ourselves on the screen, of seeing Latino images on the screen which has been rewarding when it has happened, but I think what you are saying is we are not going to be satisfied with just seeing ourselves on the screen. You are giving us that. Carlos Avila: You have to go beyond that if Latino films are to continue in the realm of commercial filmmaking. It's a process of evolution. We've gone through the phase where Latino films were primarily meant for cultural, social, and political empowerment. We've drawn a lot of inspiration from that type of filmmaking. But now the next stage of this evolution is to take those ideals, to process them, put them into stories, and touch people on an emotional, human level. Price of Glory is by no means political, but there's some subtle themes there that I think people can touch on if they are open to them.